Dreams of a New Ministry! On Friday Peter Boling and I met with Pastor Benjamin Romero in San José del Cabo. Benjamin also introduced us to his wife, Blanca and some of the people serving in the church, Jasmin and their summer intern, Othaniel. Benjamin and the others shared about the ministry of their church, and a mission church they started a couple of years ago. I felt encouraged by their passion for Christ. They are praying and working to see Christ’s name proclaimed in the region. 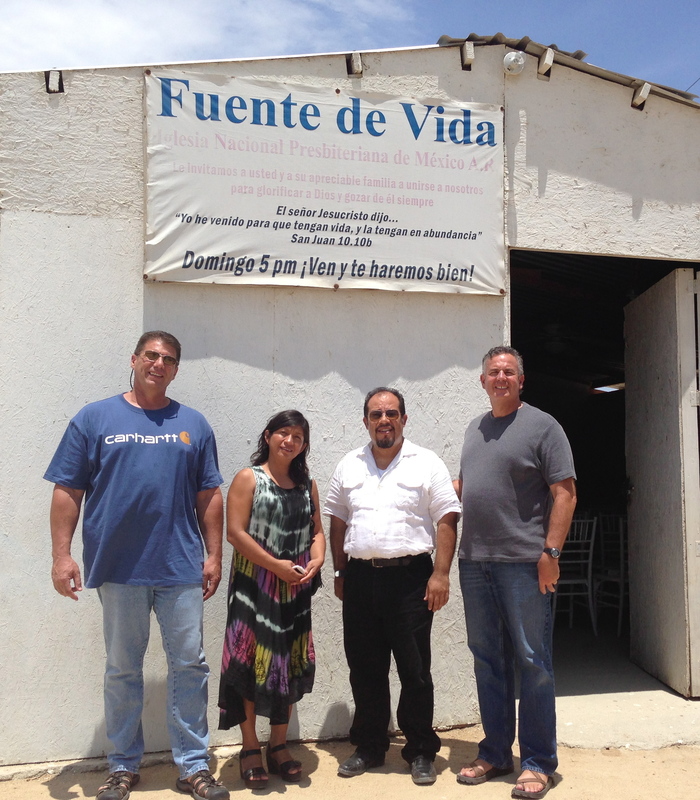 On Sunday, Peter and I had an opportunity to share at their mission church, Fuente de Vida. Our hope is that Peter will partner with them in ministry to strengthen their work, but to also work with a church planter to start a new work in La Paz. The city of La Paz is about two hours from Los Cabos. It is the capital of Southern Baja California. It is an important city for the region. The National Presbyterian Church of Mexico has targeted 10 key cities in northern Mexico where they presently don’t have works. Their goal is to plant churches in these cities by 2020. La Paz is one of these cities. It’s exciting to see the expansion of God’s kingdom in the area. What a blessing that we get to be a part of this new work! Pray with us as we establish a firm foundation to minister together with our new friends in San José del Cabo. Pray that God will lead the way for us to set up a beach head, a new church in La Paz. Our hope is to start the initial phases of the church plant in 2014. We know we need much prayer to see this happen! Pray too for the ministry of our new friends, Benjamin and Blanca Romero, along with Jasmin and Hugo, and their summer intern Othaniel. That their church will grow and flourish and God’s Spirit moves in and through the church. What a great vision. May God bless it richly! Thank you for your encouragement. We do pray that God will bless it and make it happen! Ending on a High Note in Los Cabos!